How’s everyone’s summer going so far? I know it’s been a pretty hot one in LA but it was even hotter in Virginia when I visited last week. Today I’m sharing a light denim shirt outfit with you so that you can combat that heat. I wore this outfit back in the spring of 2017 but it’s totally wearable for summer as well. 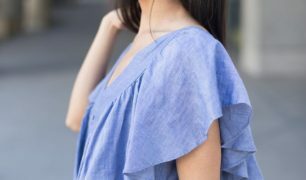 This particular denim shirt has long ruffled sleeves with gives me my own personal breeze in this summer heat. I like to wear light colors this time of year so I pair the denim shirt with khaki pant. This outfit is very casual and perfect for any summer casual events you have planned for the summer! One thing that comes to mind when a small girl wears polka dots, “She looks like some sort of Disney character.” Lucky for you, I have a few tips for you to wear polka dots while still looking mature and stylish. The following tips are strictly my opinion from numerous years of wearing polka dot outfits as a petite woman. The size matters. A polka dot design with bigger dots make you appear younger. If at all possible, stick to subtle polka dots. The color navy with white polka dots is a very safe choice when it comes to color. In this case the size of dots don’t matter as much. Choose the style of the outfit containing polka dots wisely. The style of the item can out weight the design and add serious maturity. As you can see in my outfit the style balances the dots nicely. Avoid polkadots flair dresses and skirts, As petite individuals, we gravitate to faired dresses and skirts but make sure to avoid a polkadot pattern in these items. Avoid matching polka dot accessories, for example polkadot shoes, headbands and belts as a petite women, it will put you back a few years. Online shopping is HUGE right now but the return rates are just as big! Why is it that nothing seems to come in the right size when you order it online? Great! Now check your email to make sure we have the right address!